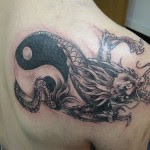 Many people when choosing what tattoo choosing representative symbols, recognized worldwide, and that above all things reflect a message that they want to convey, one of these symbols, perhaps one of the most tattooed is the Yin and Yang. Although born of Eastern philosophy today his message is almost universal, as it has reached all corners of the world. Is based on the duality of everything in the universe, fundamental forces, opposite and complementary at the same time, although many simplify this by saying that the Yin and Yang represent good and evil, which also makes sense. It is an existential stance that has a single purpose: the harmony of the universe, the idea of balance, and those who choose to stamp this symbol on your skin, often want to reflect the harmony and balance in your life. Here are some models we balanced wishing for that symbol tattooed.